RG1386AP – Two beautiful new villas for sale Rogoznica are situated close to the azure blue sea in a mesmerizing bay in Rogoznica area. The villas are semi-detached and each consists of two levels plus the third level where you can find an excellent roof terrace. Each of the villas for sale Rogoznica features a pool with a spacious sundeck on the ground floor level; the living area on this level features a toilet, a storage space, a hallway, a kitchen, a dining room and a spacious living room. The upper level features three bedrooms and two bathrooms. The amazing roof terrace of almost 65m2 is a great area to arrange an outdoor dining space where you can enjoy amazing sea views while eating delicious Dalmatian food with your loved ones. Villa A has a surface of 171m2, and villa B is 175m2 and each is being sold for €380.000. These properties represent a great second home as well as a great business opportunity if your plan is to be in the rental business. These south-oriented properties are placed on the edge of the building zone, thanks to which you can enjoy a great view of the sea. 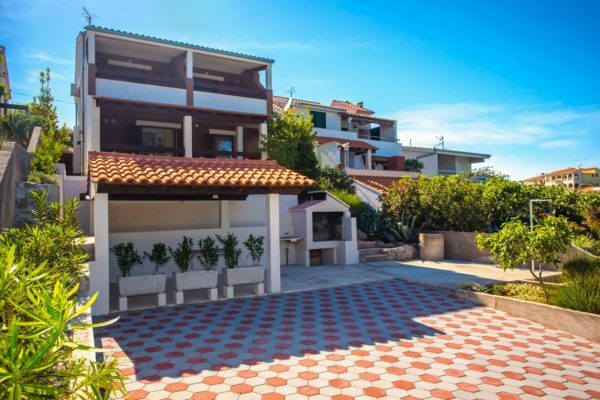 This is a quiet area surrounded with beautiful Mediterranean nature that is at the same time close to amenities such as a few local shops, bars and restaurants. The center of Rogoznica is some 12 kilometers away and there you can enjoy more restaurants with excellent local cuisine as well as a bank, ATMs and the excellent Marina Frapa.